The irritable bowel syndrome (IBS) may be defined as a painful chronic abdominal symptom complex which is usually associated with altered bowel habit, and for which there is no discernible underlying structural abnormality. It is generally accepted that symptoms are generated by abnormalities of gut function, including altered sensory perception, abnormal motility and, in some patients, abnormalities of epithelial function. Behavioural factors are important, particularly in the reporting of symptoms. What is lacking is an understanding of the pathogenetic mechanisms that alter gut function. IBS is a heterogeneous condition, not only in its clinical presentation and pathophysiology, but also in terms of its pathogenesis. While both central and peripheral factors have been implicated in the pathogenesis of IBS, this article will restrict itself to an evaluation of the evidence supporting inflammation as a basis for altered gut function in IBS. In considering the role of inflammation in IBS, one is prompted to make a comparison with asthma. Like IBS, asthma was once considered a psychosomatic disorder, particularly in non-atopic children. For more than 50 years the treatment of asthma focused on the pharmacological correction of abnormal end organ physiology (that is, airways hyperresponsiveness), an approach that is similar to current therapeutic approaches to IBS, and which are aimed at modulating motor activity or sensory perception. The subsequent discovery of inflammatory cells in the normally sterile broncheoalveolar lavage led to the recognition of asthma as an inflammatory condition. There are two reasons why a similar shift in thinking in IBS will be difficult. Firstly, the gut is normally in a state of controlled inflammation and the challenge of identifying a subtle increase in inflammatory cell number or composition is not to be underestimated. Secondly, IBS is intuitively more heterogeneous than asthma, and inflammation is unlikely to be a factor in all cases. Nevertheless, there is emerging evidence for a role of inflammation in the pathogenesis of a least a subset of IBS patients. From a clinical point of view, there are two scenarios that prompt consideration of a role for inflammation in the pathogenesis of IBS. The first is the development of IBS in patients following gastroenteritis (post-infective IBS (PI-IBS)). This occurs in 7–31% of patients with gastroenteritis from a variety of microbial agents1-3 including parasites.4 Some studies have shown a persistent increase in the cellularity of the lamina propria and mucosa or an increase in lymphocytes in the colon of these patients.5 6 Taken together, these findings suggest that the inflammatory response to infection, rather than the infective agent itself, is the important factor in induction of altered colonic physiology and generation of IBS symptoms.7 The second scenario is that of IBS-like symptoms that occur with a higher than expected frequency in patients in remission from inflammatory bowel disease (IBD), particularly ulcerative colitis.8 It is likely that the inflammatory process during acute exacerbation of IBD induces sensory-motor changes in the colon that have been shown to persist during remission9 and which may be a basis for generation of IBS-like symptoms. The observations made in these patient groups are supported by studies in animal models of infection and inflammation. It is well recognised that an inflammatory response, which is largely restricted to the intestinal mucosa, may cause profound changes in the function of smooth muscle,10 enteric nerves,11 and interstitial cells of Cajal.12 Some of these changes also occur at remote non-inflamed sites,13 producing extensive disturbances in gut physiology. These studies also demonstrate that the changes in gut physiology result from specific components of the inflammatory response, including T lymphocytes10 and macrophages,11 rather than simply the presence of the infective agent. Of particular relevance to the above described clinical scenarios are demonstrations of persistence of altered physiology after recovery from infection and resolution of the mucosal inflammatory response.14-17 In studies of primary nematode infection in the mouse, successful expulsion of the parasite and resolution of the inflammatory response was accompanied by dysfunction of intestinal muscle and enteric nerves14 for 4–6 weeks. In addition, there was evidence of increased substance P levels and altered sensory perception following balloon distension of the colon 4–6 weeks post-infection.15 16 While T cells are required for the initiation of the changes in muscle contractility during the acute infection, the changes that persist post-infection are maintained by cyclooxygenase 2 derived prostaglandin E2production by resident cells, including smooth muscle.17Since the persistent changes in muscle function could be reversed by a short course of corticosteroid, administered after recovery from infection, they reflect a low grade inflammatory process in the muscularis externa. Animal studies provide clear demonstrations of the abilities of immune or inflammatory cells to infiltrate and alter function in the deeper neuromuscular layers.10 11 The limited data from humans suggest that a similar process may occur in some IBS patients. These studies were performed on full thickness biopsies or surgical specimens, and are therefore restricted to patients with severe functional disturbances. Full thickness surgical specimens from the colon of patients with “spastic colitis” revealed mast cell infiltration of the myenteric plexus and muscularis externa.20 Recently, laparoscopic assisted biopsies from patients with severe IBS revealed a prominent lymphocytic infiltration of the myenteric plexus.21 The extent to which these findings apply to milder forms of IBS is not known. There is limited insight into the presence of inflammatory mediators in IBS. A previous study on IBS patients with specific food intolerances suggested increased prostaglandin production on double blind food challenge.27 Studies on unselected IBS patients have demonstrated increased inducible nitric oxide synthase and nitrotyrosine expression which was associated with lymphocyte activation24 and increased expression of interleukin (IL)-1β mRNA in mucosal biopsies.28 While no mechanistic interpretation can be placed on these findings, they suggest an inflammatory presence in the IBS patients studied. 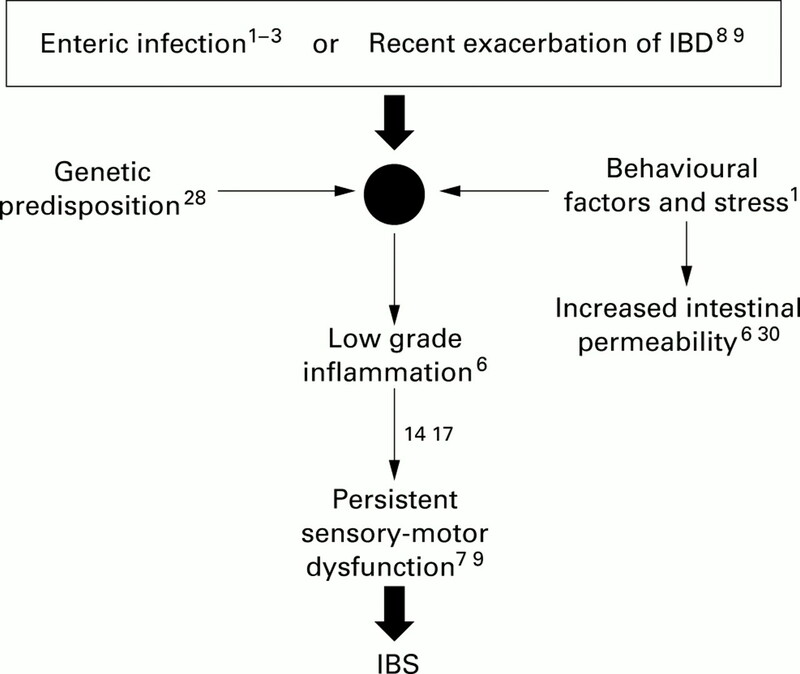 Schematic representation of the relationship between inflammation and the irritable bowel syndrome (IBS). Citations represent evidence, from basic or clinical research, that support the proposed model. IBD, inflammatory bowel disease. In conclusion, animal studies have shown that mild inflammatory stimuli can perturb the sensory-motor system of the gut and that under certain conditions these functional perturbations may persist after resolution of the inflammatory response. This process may underlie the development of IBS in patients recovering from acute gastroenteritis or a relapse of IBD. Genetic as well as behavioural factors may influence susceptibility to inflammatory signals and play a role in the development of IBS in these situations. The extent to which inflammation contributes to the pathogenesis of the remainder of the IBS population remains unclear but there are morphological data implicating immune activation in the myenteric plexus of patients with severe IBS. Future research should seek to identify markers of inflammatory based IBS, particularly in PI-IBS patients, and explore new therapeutic options aimed at suppressing the ongoing low grade inflammatory/immune response. (1992) Spastic colitis and irritable bowel syndrome: which expression is prevalent? (A review of 120 cases). Trop Gastroenterol 13:27–35. (2000) Increased rectal mucosal enteroendocrine cells, T lymphocytes and increased gut permeability following acute Campylobacter enteritis and in post-dysenteric irritable bowel syndrome. Gut 47:804–811. (1993) Changes in anorectal function in persistent bowel disturbance following salmonella gastroenteritis. Eur J Gastroenterol Hepatol 5:617–620. (1983) Symptoms of irritable bowel syndrome in ulcerative colitis in remission. Gut 24:190–192. (1989) Rectosigmoid motility in patients with quiescent and active ulcerative colitis. Am J Gastroenterol 84:34–39. (1999) CD4 T cells and major histocompatibility complex class II expression influence worm expulsion and increased intestinal muscle contraction during Trichinella spiralis infection. Infect Immun 67:6090–6097. (2000) Inflammation-induced impairment of enteric nerve function in nematode-infected mice is macrophage dependent. Am J Physiol Gastrointest Liver Physiol 278:G259–G265. (2000) Interstitial cells of Cajal and inflammation-induced motor dysfunction in the mouse small intestine. Gastroenterology 119:1590–1599. (1996) The immunomodulation of enteric neuromuscular function: implications for motility and inflammatory disorders. Gastroenterology 111:1683–1699, (Liver Physiol 1990;259:G306–13)..
(1997) Persistent intestinal neuromuscular dysfunction after acute nematode infection in mice. Gastroenterology 113:1224–1232. (2000) Long term effects of acute Trichinella spirais infection on substance P levels in NIH Swiss mice. Gastroenterology 118:A149. (2000) Hyperalgesic colonic sensory afferent pathways following T. spiralis enteritis: Involvement of NK1 receptors. Gastroenterology 114:A701. (2001) Role of immunological factors and cyclooxygenase-2 in persistent post infective enteric muscle dysfunction in mice. Gastroenterology 120:1729–1736. (2000) Disparity between mucosal inflammatory changes and muscle contractility in hapten-induced colitis in mice post colitis. Gastroenterology 118:5456. (1999) Changes in number of serotonin-containing cells and serotonin levels in the intestinal mucosa of rats with colitis induced by dextran sodium sulfate. Histochem Cell Biol 112:257–263. (1962) Mast cells in inflammatory conditions of the gastrointestinal tract. Am J Gastroenterol 37:541–545. (2000) Histopathological findings in the jejunum of patients with severe irritable bowel syndrome. Gastroenterology 118 (suppl 1) A140. (2000) Increased mast cells in the irritable bowel syndrome. Neurogastroenterol Motil 12:449–457. (2000) Increased iNOS and nitrosotyrosine expression in irritable bowel syndrome. Gastroenterology 118 (suppl 1) A702. (1992) Methods in laboratory investigation: morphometric study of colonic biopsies: a new method of estimating inflammatory diseases. Lab Invest 60:847–851. (2000) Neuro-immune interactions in the colonic mucosa of irritable bowel syndrome patients. Gastroenterology 118:A138. (1982) Food intolerance: A major factor in the pathogenesis of the irritable bowel syndrome. Lancet ii:1115–1117. (1998) Evidence of an inflammatory pathogenesis in post-infective irritable bowel syndrome. Gastroenterology 114:G3127. (2000) IL-10 and TGF-beta genotype in irritable bowel syndrome: evidence to support an inflammatory component? Gastroenterology 118 (suppl 1) A184. (1997) Stress-induced enhancement of colitis in rats: CRF and arginine vasopressin are not involved. Am J Physiol 272(1 Pt 1):G984–G911. (1998) Stress stimulates transepithelial macromolecular uptake in rat jejunum. Am J Physiol 275(5 Pt 1):G1037–G1044.